You Beauty Box and The Soil Association have teamed up to offer one of the most amazing beauty boxes you could buy at the moment. This September’s limited edition You Beauty Box is really special and represents excellent value for money. The products are worth over £75 and they are all certified organic by the Soil Association. The box costs only £20 (plus £4.95 P&P) and contains products from some of my favourite organic brands: Botanicals, Neal’s Yard Remedies and Odylique. For me it was a no brainer, I already bought myself one and if you want to try some new organic beauty products you should get it too. Botanicals Radiance Serum – I am already a big fan of Botanicals Radiance Serum (previously reviewed here). It’s one of my favourite facial oils so getting it together with the rest of the products is such a bonus. It costs £30 for 30ml on their website so you know you are getting a great deal! The Radiance Serum is 100% natural and made with 99% organic ingredients. I love it because it’s pretty light, non-greasy and it absorbs quickly. When I use it my combination skin looks healthier and I get fewer breakouts. It’s anti-ageing and great for under the make-up as well. Odylique organic eyeliner – So far I’ve been really impressed with Odylique’s organic beauty products. Their natural sunscreen worked well for me and I loved their Superfruit Concentrate. I haven’t tried any of their organic makeup yet so I am really interested in trying their organic eyeliner which is 100% natural and cruelty-free. It normally costs £12.50. Neal’s Yard Remedies Wild Rose Beauty Balm – I have heard really good things about this balm and I cannot wait to try it for myself! It has multiple uses and you can use it as a balancing mask, a deeply nourishing balm or a rich exfoliating cleanser; a true one-pot-wonder that nurtures all skin types. It has vitamin and antioxidant-rich wild rosehip seed oil that leaves skin feeling healthy and glowing with radiance. In You Beauty Box you will get a small pot of 15g. On Neal’s Yard Remedies’ website, a pot of 50g will cost you £38. Skin & Tonic Rose Mist – I haven’t tried anything from Skin & Tonic yet so I really look forward to trying this. This rose mist is made from pure organic flower water and has an addition of Aloe and Glycerin to soothe, cool and hydrate tired skin. You only get a 20ml bottle in You Beauty Box but enough to decide whether you want to purchase a full-size bottle. Terre Verdi GoodOils Cleansing Oil – This cleansing oil (30ml bottle) is a blend of organic camellia, castor, jojoba and argan oils and helps to cleanse the skin by removing dirt and make-up. I am not a fan of cleansing oils as I find it too time-consuming but I may give this one a try. Natracare Cleansing Make-up Removal Wipes – I didn’t realise Natracare sell make-up removal wipes! These are made from only the very best organic and natural ingredients which are gentle on your skin. I think these would be great for travelling. Kiki Health Food Supplements – I haven’t heard of this company before so I look forward to learning more about them and trying their products. In the box there is a pack of organic superfood samples which includes Acai Berry Powder, Baobab Powder, Camu Camu Powder, Maca Powder and Wheatgrass Powder; all 100% raw and pure. Don’t you think this beauty box is simply amazing? I do! This is such a great opportunity to buy some amazing organic beauty products at a reduced price. Will you be buying it? If you are interested you should probably hurry up as the box might sell out pretty quickly. Have you tried any of the products from this box before? This looks like a fantastic box and some great brands. I recently received the Terre Verdi cleansing oil at out GG event. I know, it’s such an amazing box and I am so glad I got my hands on it! I haven’t tried anything from Terre Verdi yet so this will be my first product but as I am not a fan of cleansing oils/balms I am thinking of giving it away now. this sounds great! i’m really into natural skincare at the moment- would you recommend neal’s yard? Neal’s Yard Remedies have some great products and I would definitely recommend them. However I don’t love every single product that I’ve tried from them in the past. For example, I didn’t like their Palmarosa moisturiser as it was too runny but I loved other moisturisers such as Rose & Mallow, Almond and Yarrow & Comfrey. I regularly buy their Frankincense Nourishing Cream for my sister who is based in Slovenia. It works well for her sensitive skin with dry patches. 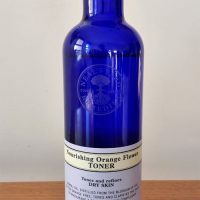 Their toners come in big bottles which makes them very affordable and I would recommend their Frankincense Toner as it doesn’t contain alcohol.